At the beginning of the school year, I filled out a form of “my favorite things” for my room mom. I love Twizzlers and those soft caramel candies with the white, sugary goo in the middle. This list was sent out to my home room students, and throughout the year, the kids brought me loads of Twizzlers. Wednesday was the last day of school. One of my drama club students brought me a decorative cup filled with the caramels, and a bag of Twizzlers. Her mom had contacted a parent from my home room to find out what my favorite candy is. This might seem like a small, almost insignificant event, but the care and thoughtfulness of that gift has stayed with me. That cup of candy beamed from the school year remnants like Bilbo’s golden ring. This week, we had a huge 5th grade celebration, a FUN DAY outside with jumpy houses, packed our rooms, completed check lists, and dragged our bedraggled selves out of the school building. Ten years of my teaching career is boxed up, and has been sent down the hallway to commence the summer hibernation. My former classroom is stripped clean of the learning whirlwind that encompassed our days. All week, I kept thinking of the book, Oh, the Places You’ll Go, by Dr. Seuss. We gave each 5th grader this book as a “graduation” gift. I have always admired its profound message. There are few books that can relate to all age groups. …you have brains in your head. Dr. Seuss, or Theodore Seuss Geisel, was an interesting character. I think my favorite story about him is when he threw a drinking party (during prohibition) at Dartmouth. He was soon released from his job as the editor-in-chief of the humor magazine, Jack-O-Lantern. This is where he began using the pseudonym, Seuss, so that he could continue to contribute to the magazine. During World War 2, he created political cartoons for the liberal magazine, PM. I guess I was relieved to see that his rhyming madness was a result of his contract with a publishing company that asked him to use 225 of the early learning vocabulary words. I had not thought about the man behind, The Cat in the Hat, until now. Think of the story, Horton Hears a Who. Was Dr. Seuss implying that there are other worlds out there? Or was he simply trying to raise our awareness of the how important all people are, regardless of size, color, faith, or political views? It is interesting that he had Horton, the elephant, protect the tiny spec of a city, on a clover. The kangaroo doesn’t believe in Horton’s story about the city. She causes the town to turn against him, because she decided he is a threat to the children. If we review history, how many global events could easily be plugged into this story? My point is (yes, there is one) that there is a back story to people and events that we may have erroneously judged. We all do it. We see a situation and make inferences. Who has the time to figure out the reasons for everything? Gregory Maguire has done well with focusing on why the antagonists in world-famous stories are misunderstood. Of course, he is best known for Wicked, where he weaves some guilt pangs through the pages, as we find out that the witch (Elphaba) has a skin condition. In Confessions of an Ugly Stepsister, the Cinderella story is seen through the eyes of one of the step sisters. A couple of years ago, I had my class take famous fairy-tale characters to court. It was a fun way to learn about the court system and how trials work. I remember the one child who was the defense attorney for Cinderella’s stepsisters. He discussed how Cinderella got all of the attention and made the stepsisters feel badly about themselves. He kept saying, “Has anyone thought about how they feel?” He used a few picture books to illustrate that Cinderella was actually smiling in many of the pictures where she was working and singing in the house. He also said that Cinderella could have just said, “no” to all of the work. The stepsisters won that case. Yesterday, I sat through a retirement celebration for three teachers. They are educational icons who had set the instructional culture of the school. I have worked along side them for three years. But, when I heard their back stories, of what motivated them to keep going; I wished I had taken the time to get to know them more. They calculated that one of the teachers (in her forty-two year career) had taught over 4,000 children. What more can be said about that? I imagine that each teacher in that room thought: What will I say at my retirement? What will I have contributed to the educational universe by the end of my career? Then a parent dropped of my end-of-the-year gift; a memory book from my class. I realized that the letters written by my students revealed their back stories. The silent thoughts, they held throughout the year were now in the form of loving prose. One student thanked me for sitting next to him and for giving him extra help. Other students thanked me for the projects and for the writing activities. They were all appreciative of the play that we wrote and performed. I knew, without a doubt, that the endless hours devoted to this year, were worth it. I am also grateful to the person who took the time to find my backstory-even if it is just about the types of candy I like. I suddenly became an amalgamation of all of my students as I pulled into the parking lot. First, I had to go to the book store and spend $200 on text books. I feverishly searched for the cheaper used books-I found two. Later, a lady in class told me that I should have either rented them, or bought them on Amazon. Rent text books? Really? Now, I know. I made it to the classroom, and I was happy to see other people straggling in, calm and happy-with smelly snacks. I don’t like introducing myself. What does unique really mean, anyway? No, too anti-system. Not a good start. I can dance very well, wearing socks, in the kitchen. No, that is stupid. I can mix a mean Mojito. No, then they will think ill of me. A colleague and I started drama club at my school. Yes, not boastful, yet something new and different. I went with that. I listened to the other unique experiences. Some were happy they weren’t moved to other grade levels. Some lost weight. Man, I could have gone with something simple like that? I thought of a girl in my class who over-thinks everything. No wonder she has bulleted note-card lists all over her desk. I moved around in my seat, trying to get comfortable. Only thirty minutes had passed, and I had to sit still for another three and a half hours. I doubted anyone was going to let me walk down the hallway, touch the last door, and come back. I looked out of the window, and stared at the trees. Oh crap! What did I miss? Ok, just a snack sign-up sheet. I rarely make my kids sit still in class, they can stand, sit on the floor, or take a break when needed. I was very glad that I had made this a regular practice in my classroom. Especially since I seemed to be the only one squirming and searching for a comfortable sitting position. Now, let’s get on with class, and stop all of this silly getting-to-know you stuff. “We have to read four chapters, write a paper on educational philosophy, and write two article critiques, for next week?” I hoped the panicked look on my face was mild. I had read syllabus wrong. I did find a better way to create the schedule, on the syllabus, so that it was easier to read. I kept those thoughts to myself. Then everyone started talking about the Galileo website where we find all of our peer-reviewed articles. Of course, I know about Galileo. But what about the password? How will I get it? What if it doesn’t work and all the papers are due next week? The two kids in my class, who are the “what if” kids, blasted through my mind. I had to go to the library to get the new password. I couldn’t get the new password because I didn’t have my new school I.D. I didn’t have the new school I.D. because that building closes at 6. So, thirty minutes later, the gentleman behind the desk gave me a temporary library card. It took so long because I didn’t have my school identification number with me. He had to look that up. He made me promise to get my school I.D. in order to get the permanent card. Then I thought of the students who always take an inordinate amount of time in the library. I always ask, “What have you been doing for so long?” Now, it is all clear to me. They lose time, or it wrinkles as they enter the library-like it did with me. Although we are in the last weeks of school, this experience has made me very conscious of the thoughts and processes that occur with my students. How often we forget what it is like to sit on the other side of instruction. Nervous, confused, frustrated, and scared to ask for clarification. The further away from we are from being students, the less empathetic we are to the mindsets of our own students. After the stress of the first week dissipated, I found the classes to interesting and valuable. My homework is done, and the discomfort of learning has set in; resulting in a forest fire of synapses. My obsession with pens is another issue. Did the kids learn from you today? How do you know? Most of these items remain unchecked, or maybe they get half of a check, on certain days. Except for the United Streaming one, I learned my lesson two years ago. Thomas Edison invented the first motor powered camera. The camera was used to film…well, ladies dancing-with big feathers. At the end of the year, I can’t help but wonder if I missed something. Is it really over? Did we really spend eight months together? Did I freak out about some who weren’t where they were suppose to be, and fret over enriching those who were beyond the grade level? Did we learn all that the state says we needed to? Did the kids get the idea about random acts of kindness? Did I show them that I truly love them all? Is this really my last year teaching 5th grade? All of this reflection is prompted by change. Change is difficult, especially when circumstances and events end, and the unknown is looming. This year, I have said good-bye to one dear friend, who is now in Omaha. She is my touchstone to my first years of teaching. I think about her every time something oddly funny occurs, and wish I had just another moment to teach with her. I’m preparing to say good-bye to another friend, who is moving to New York. He began some powerful theater projects that made people “think” outside of their comfort zones. Could there be a friend check list? We have eight days of school left. August will be here before we know it, and the worries of the new school year will commence. There will be a checklist for the beginning of the year. I’m sure I’ll philosophize it until it is beyond recognition. Until then, my goal is to attempt to welcome some of this change. Take one step forward, and breathe. Check. For some reason, Mother’s Day, this year, has me distracted. Maybe, it is having seen ten years of children and parents move through my life. Maybe, I’m in awe of the unyielding devotion and support I see from the parents of my students. It could be that I just miss my mom. Over the weekend, I searched for a picture of her, where she is a “hot mom”. She is standing next to her green Ford LTD, wearing shorts, a red top, her famous bun, and Jackie O. sunglasses. I couldn’t find it. I chose this picture because it was when I didn’t know her, and that seems fascinating. She passed away seventeen years ago. My Aunt Evelyn and my grandmother came to care-take my mother during the last months of her cancer battle. They lived in New York, and they traveled back and forth for six months. Both ladies have since passed, and Mother’s Day is always full of memories of them. They showed me selflessness and forgiveness. I found my ballet pictures. Aside from the fact that I came to the brutal realization that I still wear my hair like this, I remember her taking the pictures. I didn’t understand why it was so important for her to take this photo, but now, the idea of capturing random moments of our children’s days, makes sense. Although my life took a different direction, the fact that I was encouraged and supported, made a difference. I found two other pictures in my search. 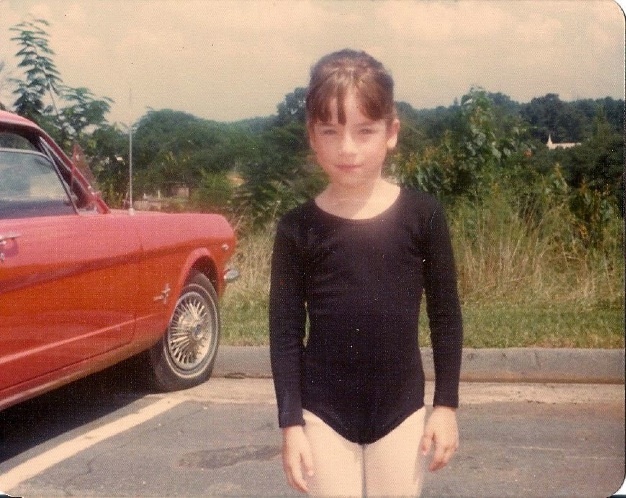 They were of me and my daughter, striking similar ballet poses-we were both about seven. I was hit with the realization that we know and understand our children more than we think we do. We are more similar than dissimilar. It is possible, that we may have had the same thoughts when those photos were taken-on two separate days, twenty-five years apart. As I was looking through the pictures, I saw the generations of mothers in my family. Black and white pictures from one era swiftly changed to the color pictures of another. I thought of this the other night, after both of my girls finished performing in, Alice in Wonderland. I have a couple of students in the production, and their moms have been there, sewing, painting, bringing snacks, and supporting their children through late nights and homework. I saw the parents of the teens in the show, ironing, cleaning, doing hair, sitting in the audience, and radiating with pride. Next week is our performance of Cinderella. Today, as we were rehearsing, there were three moms in my classroom; creating props. They also brought snacks for the entire cast. Each told me to call them if there was anything else I needed before the big day. Years ago, I had a student in my class who had a brain tumor removed the previous summer. The family was overwhelmed with treatments and doctor visits. Somehow, his mom would find time to bake me, “naan”. If you don’t know, this is probably the best bread in the world. She would make sure it was warm and tightly wrapped in foil. She was always smiling and joyful. This woman, this mom-made a difference. I became a step mom when I was twenty-three. I think of that now, and wonder how my step kids ever took me seriously. Especially, when they were in trouble, and I had to go be the “parent”. Having been a mom for this long makes me think I should be an expert by now. Not so much…there are days that I wish I were back on that ferry to Capri, listening to U2, on my Sony Walkman. Sometimes, I wish I could stomp upstairs, slam the door, and blare my music. Being a mom requires that we remember when we weren’t moms, when we had bad hair and odd boyfriends. When we fought against the rules, and pretended not to care. 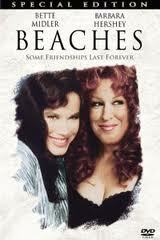 This past summer, my eldest daughter and I watched Beaches. The last scene, where Bette is on stage, and singing to her best friend’s daughter, tears me up every time. I watched that movie with my mom. She was crying, and I remember thinking, “Why on earth are we watching this?” I didn’t get a comment from my daughter, just an odd look. I had to giggle, because I knew exactly what that look meant. Maybe, this weekend, we will watch, Terms of Endearment.